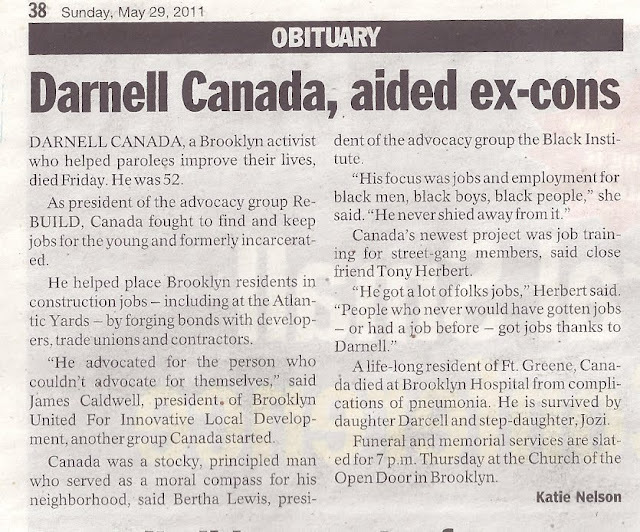 Fort Greene resident Darnell Canada, one of the most memorable characters in the Atlantic Yards saga--aggressively interrupting public meetings to shout that "jobs" should trump concerns about the megaproject's impact--died May 27, of pneumonia. He was 52. A bulky black man from the 'hood, Canada could speak powerfully and extemporaneously from the heart--and from the gut. His performances at public meetings made for crucial cameos in both the new documentary Battle for Brooklyn and the 2007 film Brooklyn Matters. If Atlantic Yards didn't pass and the fellow ex-cons he was helping didn't get work, he warned ominously, "you're the victim." This echoed the mau-mauing author Tom Wolfe described in 1970, but it came with an Atlantic Yards twist: Canada took on middle- and upper-class neighbors, mostly but not exclusively white, who opposed the project, and even challenged officials holding public meetings. 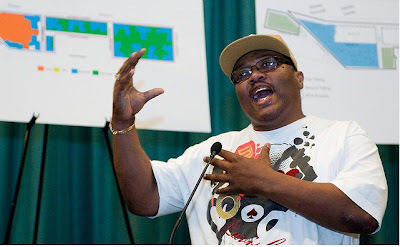 Indeed, Canada's role in Atlantic Yards--which he saw less as support for the project than as urgent advocacy for his community--defined him such that the program for his memorial service featured a photo of him speaking at a 7/30/09 public hearing (also above, by Tracy Collins). Canada chose his Atlantic Yards path early on, calculating that he couldn't afford to oppose it, expecting the project to deliver results to his neighbors in the Fort Greene housing projects, jobs they missed because the neighborhood never reaped benefits from the decades-earlier construction of Forest City Ratner's MetroTech. He felt that need acutely, having succumbed to the streets and turned his life around in prison. Others joined him in such a calculation, as City Council Member Charles Barron observed in the 11/12/06 Times, "The devil could bring in a project and say it's jobs and affordable housing, and some of us will go for it, because we're on a survival level." Canada, in his more thoughtful, one-on-one persona, as in several interviews below, would acknowledge that it wasn't an easy decision. Of course such projects had unwanted impacts, he allowed, but his advocacy for jobs--including and beyond Atlantic Yards--defined him. In public, he toed an uncompromising line, as if pressed by a premonition that his time was short. However, the worm had begun to turn. As his friend and fellow advocate Martin Allen recently recounted, Canada had grown frustrated with the lack of progress in local hiring and contracting--and supported plans for a protest at the Atlantic Yards site like the one Allen led last month. As president of the advocacy group ReBUILD, Canada fought to find and keep jobs for the young and formerly incarcerated. He helped place Brooklyn residents in construction jobs--including at the Atlantic Yards--by forging bonds with developers, trade unions and contractors. The obit quoted such friends and associates as activist Tony Herbert, and James Caldwell of BUILD (Brooklyn United for Innovative Local Development), an Atlantic Yards Community Benefits Agreement (CBA) signatory that Canada helped found but left shortly afterward, levying ambiguous accusations against unnamed BUILD officials. Canada was eulogized at the memorial service June 2. "Person after person got up to say Darnell worked so hard to get me a job," observed Mike Galinsky, the Battle for Brooklyn filmmaker who interviewed Canada at length and attended to pay his respects. "Darnell Canada and I were close from the first day we met," declared Randall Toure, former staffer for Assemblyman Roger Green, who moved to Forest City Ratner to help organize the CBA. " I’ve never met anyone with such integrity. He did not move one iota -- strength, commitment and his love." In the Daily News, Bertha Lewis, ex-head of ACORN (and now head of The Black Institute) described Canada as "a stocky principled man who served as a moral compass for his neighborhood." If Canada was a "moral compass," he was a complicated one, for reasons unexplored in that obituary. As a youth, he embraced the streets, preying on neighbors, then, in an admittedly misguided effort to gain jobs for those in his community, attacked a man and spent seven-and-a-half years in prison. Behind bars, Canada learned how to read, and pursued higher education. He emerged knowing that he never wanted to return to prison, or to resort to his fists. With newfound religious faith, and a belief in hard work and self-discipline, he dedicated himself to fight for his community, to help teens and gang members and especially those, like him, who'd done time "upstate." "Although he could intimidate you, he could also ingratiate you," the Rev. Mark Taylor, of Church of the Open Door, said at Canada's memorial service. "Darnell Canada was like a Rock!… Darnell was with Frederick Douglass: Power concedes nothing without a demand. Darnell fought." He did, and he didn't. He made a calculation regarding Atlantic Yards that he'd fight not Forest City Ratner but anything that would slow the developer. Commenting on their respective roles, BUILD's Caldwell observed at the memorial service, "My job was to be that nice guy--Darnell Canada to be that tough guy." "He was an institution builder, a coalition builder," commented Council Member Letitia James, who though differing with Canada on Atlantic Yards stood with him at other community events. "Darnell hated the image of idle black and Latino men on the corner. He had American beliefs--in hard work. He believed all of us should be given a second chance." Among others present at the memorial, according to Hagan, were FCR’s Scott Cantone, BUILD’s Shalawn Langhorne and Lance Woodward, FCR ally Thomas "Ziggy" Sicignano, CBA Coalition Chair Delia Hunley-Adossa, and Community Board 2 Chairman John Dew. In this blog, I've mentioned Canada several times, but a look back reveals an even more extensive record at public meetings, usually with followers, those trained for construction work by his groups REBUILD (Real Economics Building Unity and Innovative Local Development) and P.P.E.E. (People for Political and Economic Empowerment), wearing hard hats and reflector vests. In January 2007, I described the most mesmerizing segment from Brooklyn Matters, a scene from the 8/23/06 hearing on the Draft Environmental Impact Statement. “The whole Community Benefit Agreement came right out of me and a couple of other people," declared Canada, dressed in a bright orange shirt, the color echoing a construction vest, comfortable at the microphone, speaking deliberately. "The whole process of getting jobs, because we need them so bad. And you know what, it really gets to me that people don't care." It was, on one level, a reminder of the desperate need for jobs, Brooklyn's very uneven recovery, and the mix of calculation and faith that informed Canada's decision. It also represented gripping theater, in which a man with undeniable street cred was speaking for a Cleveland-based corporation whose decisions, as we've learned, are dictated by the bottom line. Canada acted similarly at a July 2009 meeting organized by the Empire State Development Corporation to answer questions about the revised project. FCR executive MaryAnne Gilmartin of Forest City Ratner was asked about the project, and Canada interrupted. “We need the jobs, we need to start working," he shouted. "Same old questions. Same old questions. Same old questions--when’s it going to change?” Canada was an ally, but Gilmartin did not seem particularly comfortable with his interruption. Canada, notwithstanding that performance, was selected for the Comptroller's Task Force on Public Benefits Agreements, a carefully balanced group that included a representative from developer Forest City Ratner as well as some critics of such agreements. The report, as I noted in September 2010, treated the Atlantic Yards CBA rather gently. This sequence, in which Canada interrupted a Q&A with Forest City executive Jim Stuckey, was excerpted in Battle for Brooklyn. Canada's associates stood up, furthering the interruption, and he declared, not inaccurately, "If I don't say nothing, there ain't nothing being said." Canada was quite willing to discuss his miscreant youth, in interviews and in Ryan C. Mack's 2011 financial literacy book, Living in the Village: Build Your Financial Future and Strengthen Your Community. On a video posted 1/23/11, Mack interviewed Canada, reading from a vignette in the book. "At age 28, I gained a reputation as a drug dealer, a drug user, a stickup kid, a thief, and muscle for hire," Canada described himself. "Most people looked at me as a street thug who was no good for himself or anybody else." He had gotten probation for breaking into a store, then probation for possession of a controlled substance and a firearm. Finally, he was arrested for first-degree assault. "I spent many years in jail, and rightfully so," Canada recalled. "But my lack of education and lack of a moral and spiritual foundation played a big part in my delinquency." Fort Greene's projects were rough--Canada in another interview recalled "Vietnam nights, when you slept on the floor"--but he grew up in a two-parent family. He told Mack that his parents "taught me right from wrong… but the streets didn't say that… the streets said… you have to survive." So Canada was drawn to a world where "the toughest survive, the most wicked survive, the guy who will stomp somebody's head out and don't even blink an eye or worry about it survive." He never learned to read or write, "busy frontin'" to pretend that he followed the news. "I became a good parakeet." That was part of his advocacy for jobs, part of construction coalitions (as described here) unafraid to go into literal combat at work sites. Canada told director Galinsky how he'd fought for jobs at the MetroTech site:. "At that time, I could truly say I wasn't the same person. Then, either you give it or we're going to war. I felt they were taking from us, and I felt it was right. I put my hands on them, which was 100 percent wrong." In the interview with Mack (a REBUILD board member), Canada described how, after he'd received his prison sentence, he stealthily accumulated pills while at Downstate Correctional Facility, bent on suicide. But he had a visitation from "a correctional officer telling me 'it's not my time," then praying with him. The next day, Canada said, he learned no such officer had been on the block. "Maybe this was my angel." He wrote, "I wholeheartedly believe this was God's way of giving me another chance." So, over his stint, he got his GED, then earned associate's and bachelor's degrees, the latter in psychology. He committed himself to Christianity. And he changed his ways. "When I was young, I wasn't always on the side of good," Canada further recounted, in a 12/5/09 interview with Mack. "I wanted to do something about the problems that people like me had… I don't want criminals walking around my mother, my aunt, my nieces." So the solution was not prison, but education. In another video, Never Going Back with Ryan Mack, Canada on 10/20/10 addressed fellow ex-cons, advising them to "give themselves some time… to making sure they're up on time, that they follow through with their goals." He added that it was far better to have self-directed discipline than to be in a correctional facility: "It's better than being told when to go bed, when to wake up." Canada was politically astute, picking up fees for organizing petitions and doing other political work for Assemblyman Roger Green, Assemblyman (and Brooklyn Democratic Party leader) Clarence Norman, Jr., and, last year, for Friends of Mark Pollard, who unsuccessfully challenged state Senator Velmanette Montgomery. In July 2009, Canada drew several elected officials, including Council Member James and Assemblymember Hakeem Jeffries, to advocate that federal stimulus money "is used for the creation of jobs in the community. Unemployment is over 50% for Black and Latino men in the United States, particularly in public housing where the rate is more than 70%." The event was covered by the Epoch Times, and the construction worker garb looks much like that worn at some Atlantic Yards events. In that December 2009 interview, Canada said, "We've been able to put over 1500 people to work," offering them "ten-hour OSHA training, four-hour scaffold training," and recently held a graduation ceremony. How does it work? As his associate Allen explained, REBUILD and P.P.E.E. get the workers trained, first, a more mainstream path than the oft-violent construction coalitions in which he and Canada began. "See, we don't get phone numbers and get fliers and read newspapers to get people jobs," Canada told Mack," we get out there, we get in the street, we go from job to job, to job to job, talking to the people, talking to the owners, talking to the contractors, talking to the people and convincing the that you need to at least give us a try. And once they give us a try and they see the certifications, we had more certifications than some of the foremens on the jobs, so we're more qualified..…. we give people training in something they can use… we understand the process of the developer, what he needs, and we understand what the people need." While billions of dollars were being spent in downtown Brooklyn for new construction, we could not obtain jobs for residents who lived within a ten-block radius of this construction. We were told that the people who lived in the community were lazy and incapable of handling the work safely. I am happy to say REBUILD has lived up to the challenge, responding to the negative feelings that some contractors and developers have had concerning not just the people in the immediate area, but also certain classes of people--formerly incarcerated individuals, people on public assistance, and those who are homeless. "You're probably connected with every major developer in the city," Mack said in one interview. "Every major developer, Forest City Ratner, the Downtown Brooklyn Plan, with Joe Chan [of the Downtown Brooklyn Partnership], who's connected with them all," Canada replied. "We're connected with the Coney Island development… and anything new, we're trying to get connected with that too." Canada got involved with Atlantic Yards when he got a phone call from Toure, who'd gone from Assemblyman Green's office to the developer. "I didn't even know he was working for [Forest City]," Canada told Galinsky. "He said, I would like to talk to you to make sure people get employment… I want to make sure that that 78% [unemployment ratio in the projects] is definitely dealt with… That's deep, because I didn't expect that." Canada was one of the early proponents of the Community Benefits Agreement, and, along with fellow BUILD officer Eric Blackwell, co-led a February 2004 meeting, at Forest City Ratner offices, with potential signatories. As the meeting began, Bruce Ratner popped in to thank the participants for their support, leading one observer from Prospect Heights, Gib Veconi (later active in Brooklyn Speaks), wondering why a meeting presumably bent on learning the terms of Ratner's proposal treated the plan, and support for it, as a done deal. Veconi had been invited by Caldwell, with whom he'd long worked on the 77th Precinct Community Council, in order to help diversify a largely-black group. Soon after he joined Caldwell, Canada, and two others from BUILD at lunch. "I think we can accomplish a lot if we pull communities together," Veconi recalls saying. "I already know how this is going to work out," Canada responded emphatically, in Veconi's telling. "We're going to do this deal with Ratner." "How could you possibly know that at this point?" said Veconi. "You couldn't even know what the terms are." "Oh, I know," Canada responded, adding that "we don't need anybody else to get this done." His reasoning--reprised at a public meeting captured in Battle for Brooklyn--was that Atlantic Yards opponents had not organized in support of his community, when the city Housing Authority renovated apartments at Ingersoll, displacing residents. At BUILD, Canada told Galinsky, he was focused on jobs, but others had broader issues. So Canada left BUILD in March 2004, just a few months after it launched, immediately starting REBUILD. "I am resigning out of the need to distance myself from those in the organization who see this organization as financial self gain, [rather] than for the needs of the Brooklyn community,” Canada wrote in a letter, as quoted by the Brooklyn Paper. Canada, to my knowledge, never amplified that statement. In conversation with Mack, Canada made an allusion to BUILD. "I went through some problems in building organizations, members of my organization said, we need money, we need money, we can't work with these people 'til we got money, and I resigned from the organization because of that, and the next week, I had an office… and I was putting people to work." While Canada clearly thought some people were trying to get rich, former BUILD head Blackwell told me that he had advocated for funding to equip BUILD to better negotiate an agreement with a developer that had far more resources. "A lot of that stuff got lost on the way" because of the pressure "to get a deal done with the community," observed Blackwell, who teaches urban studies at Long Island University. Canada told Galinsky how he'd literally fought for jobs at MetroTech: "At that time, I could truly say I wasn't the same person. Then, either you give it or we're going to war. I felt they were taking from us, and I felt it was right. I put my hands on them, which was 100 percent wrong." So he learned to get involved before, not after "the process has been worked out." After all, despite participation from "the broader minority community," the people living nearby were left out. "I don't want to be the guy who fights…and try to go to the table after," Canada observed, 'and all the seats are taken. That's why I want to be at the table... for one reason, and one reason only… to get the jobs." "The only thing I knew was this," he told Galinsky, indicating his meaty fists. "I went on the Brooklyn Bridge and I used these, went into Cumberland Hospital and I used these, went to Borough Hall and I used these… because I felt this was going to bring us work." He recalled going to Borough Hall and being told one man was "is charge of giving jobs to the community and he says the community has given jobs." And, in what Canada recalls as a "stupid" move, he asked, "Is this the guy in charge of getting jobs, are you sure? and he said Yes… I commenced beating him down… and I spent seven-and-a-half years for something that took 30 seconds of my life to do." "I wouldn't have put my freedom on the line if everything had been all right back then," he mused. "Can it be right now? Yeah, if they sit down honestly, and they come up with agreements honestly. If everybody involved is honest and works out an agreement that's real... yeah, it would be all right." "If the PLA is worked out with the unions, yeah, it would be all right," he added, "but it wasn't all right back then." A Project Labor Agreement (PLA) would allow small nonunion companies like his own window installation business "be union for that job, and that job only," While he couldn't bid for jobs as a union shop, "a PLA helps small companies get a piece of the pie." "My life, as an individual, is devoted to paying back for all the wrongs that I ever did," Canada declared said. "I have a saying: 'What do we come into the world to do?' If we didn't come into the world to make it easier for someone to come in behind us, then somebody tell me, what did we come in to existence for?" Canada told Galinsky that Bruce Ratner "sounds like a sincere person, wants to affect the 78% unemployment… even him, with the way the unions and everything else is structured, he can't affect everything." Canada, prompted by his interviewer, allowed that "the traffic is crazy… the only benefit in this project is that people who are poor people who don't have money to take care of their families will be able to do that." And, in a quirkily individualistic observation, Canada commented that he personally liked the idea of a large arena--rather than a small one--"because I'm afraid of heights… My fear might bring me to say I want it to be big… for the interests of the community, I wouldn't want it to be overbearing." Asked if he'd seen alternative plans for the Atlantic Yards site, such as the UNITY plan devised by architect Marshall Brown, Canada said he hadn't but hoped to talk with Council Member James to get "people who are knowledgeable, from both sides… [to] sit down and come up with a solution." In that interview, he even suggested that a project with a $2.5 billion budget--then the Atlantic Yards price tag--should be enough to bridge the gap between people who need jobs, people who don't want to lose their housing, and those who don't want their community to change. Canada took it in. "It never came to my mind to question that statistic," he responded. "And I'm into this… That's deep." Not upset but thoughtful, he said he was "wondering how many people can I put into apprenticeship… you opened up some questions for me to ask." "That's one of the things I always fear, given misinformation," he said. "Since I was 14, I've been trying to get people jobs… for me to mislead other people, it would undercut my ability to help my community." Galinsky said "they're going to say 15,000 jobs," and Canada said he'd prefer it described more simply. "I got 1000 jobs, people are going to work 15 years… out of that, a certain number union… Out of that, if your community gets ten percent, they're only getting 100 jobs… I prefer for somebody to say that than to try to make me think." But that didn't turn his opinion. "Even if that's true, and I see the unemployment, that 100 will do a substantial good for us," he mused. "At least we could say we have 100 jobs we can fight for.. or we have 100 jobs, it's not going to do anything significant in terms of denting unemployment, versus we have all this traffic… you can allow people to weigh it." "I'm glad you brought that up, because you definitely gave me something to take the next time I meet with anyone from Ratner," Canada said. A few years later, though, he wasn't trying to weigh it. Canada felt the need for jobs acutely, in part because he saw young people going down the wrong path, lured by easy money and without good alternatives. During his interview with Galinsky, in approximately June 2004, Canada reflected on a recent drug bust in the Ingersoll Houses, resulting in 43 arrests. A violent drug gang that terrorized a Brooklyn housing project and used kids to peddle dope was busted after a crackdown that resulted in 43 arrests, authorities said yesterday. Canada was skeptical about the official report, and not unsympathetic to the lure of street culture. "Yeah, a lot of things those individuals did was wrong, but please, look at the background of them, trying to survive," Canada said. "I spent seven and a half years in prison, because I was trying to survive, and I didn't know anything else. Now I'm educated… now I read, because reading is better than food… it gives me the knowledge to compete with everybody else, it gives me the knowledge to know when someone's playing games." Individuals do the wrong things "because they did what they felt what they had to do, by any means necessary. I can't condone what people did, but I understand," he said. "Every one of those kids that was arrested, I know, … there was guys selling, and they're wrong." he said. "I know, and everybody in this community knows … there is no organized body [to be a gang]… let me tell you, they are not that intelligent." One youth who was arrested was in Canada's youth program but succumbed to peer pressure. "He was always saying, Darnell, I need a job… and I never had enough to get everybody… and right now, he's in jail," Canada said ruefully. "I look at a kid with no record in a matter of a year turn into a kid with four different sales to police… I see a life that could've been something good start going downhill." "As much as I want to fight against against some development projects, because of all the dynamics that's happening in this community, I can't afford to," Canada said. "I have to find people employment. Because if I don't, I know what happens." Canada's position exemplified, as Mark Winston Griffith wrote 11/17/06 in the DMI Blog, Death in Atlantic Yards, how Atlantic Yards, which began not as an effort to improve residents' lives but as a developer's project, nonetheless solidified support among some local activists. Canada repeated the widespread belief that renovations at NYCHA projects meant permanent displacement. In Battle for Brooklyn, speaking at a meeting held at the House of the Lord Church, he expressed resistance to the emerging Atlantic Yards opposition. "Fifteen hundreds families are being displaced in Ingersoll and Whitman, where’s the cameras?" he bellowed. "People who are being displaced that don’t look like me, and the cameras are there, I have a problem." He also said the families of those indicted in the drug bust might be kicked out. And, with gentrifying blocks nearby, the city had cracked down on quality of life enforcement. "Before you could ride bikes over here all you want.. now you get a ticket for riding a bike… smoking a cigarette… It's because of the area, the area's going up." Canada suggested that the under-construction Ingersoll community center be run by a private entity for residents who hadn't yet moved in. "It's all tied in with all the other development that's going on." The community center was not run as a private entity, but was long delayed--while private condos moved ahead much much faster. So Canada perhaps sounded like a conspiracy theorist, but his larger point--that project residents got short shrift--would be hard to refute. Meanwhile, Fort Greene was changing. A building that sold for $150,000 ten years ago is now "going for two and a half [million]. "It's unbelievable," Canada told Galinsky. And, even with the drug raids, the situation in 2004 was nothing compared to his youth. "I remember Vietnam nights, when you slept on the floor," he recalled. "Now, all of a sudden, the prices go up in the area, the real estate goes up in the area… all of a sudden, you send people [police] in… Is it because you wanted to stop crime?" On Myrtle Avenue, he said, he used to be able to rent a room for $75 a week. "That same room, it's crazy, they want $1000 a month." "If we don't get jobs making $65 an hour, $48 an hour," Canada asked, "how can we afford to stay here?" Housing costs continue to rise, and Canada's question--which animated his activism, his anguish, and his anger--still lingers. Nice piece on Darnell Canada. Please note that Our Time Press also did an obit on him shortly after he passed. Darnell Canada, a community activist, businessman and philosopher who lived for many years in the Fort Greene housing development, died on May 26. He was 52.
role in helping see the $4 billion dollar Atlantic Yards development come to fruition. During the struggle over Atlantic Yards, Coney Island and other developments throughout the city, Canada’s various organizations fought for jobs and helped train thousands of people, many of whom were formerly incarcerated, for employment opportunities. Canada is survived by his father Samuel Canada; his daughters Darcell and Jovi; his four sisters Sonia, Latoyia, Valerie and Latasha; his two brothers Shawn and Calvin; his brother-in-law Zayd Turner; his aunts Dons, Imajean and Zanobie; his uncles Linwood, William, Freddy and George; his favorite cousin Darlene and a host of other cousins, seven nieces, five nephews and many, many friends.